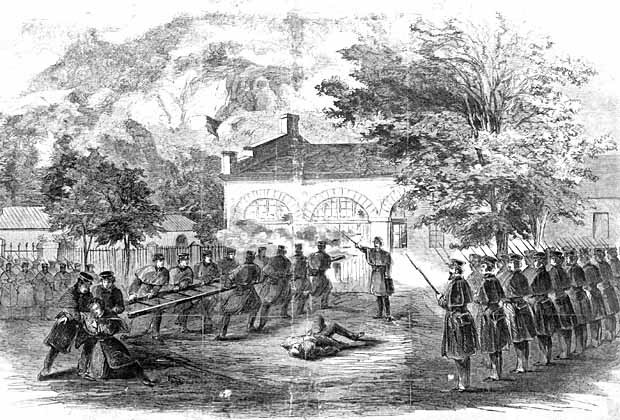 Following John Brown's raid on the federal arsenal, at Harper's Ferry, U.S. Marines surrounded his "fort" - a firehouse. This illustration depicts that event. 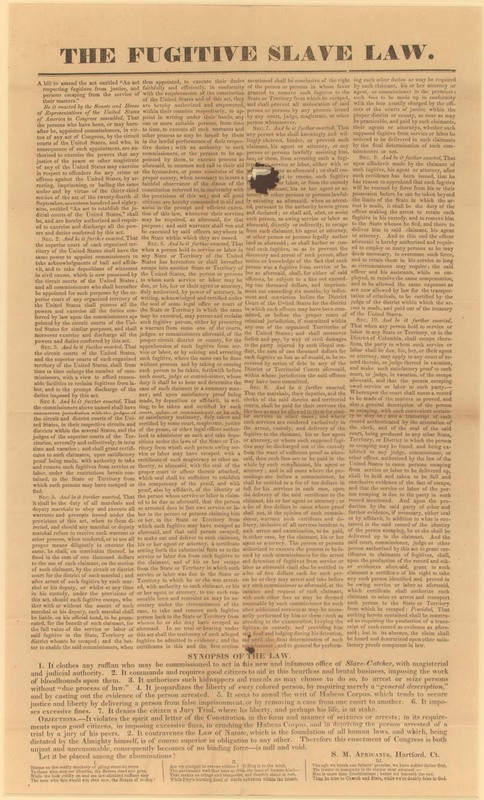 It was published in Harper's Weekly, during November of 1859, and is now maintained by the U.S. National Park Service. William Lloyd Garrison founded the American Anti-Slavery Society in 1833. The first time he heard Frederick Douglass speak, in 1841, he was impressed with the story and the man. Douglass had honed his innate skills with tips from the Columbian Orator - a book (this is his copy) he had obtained while learning to read. 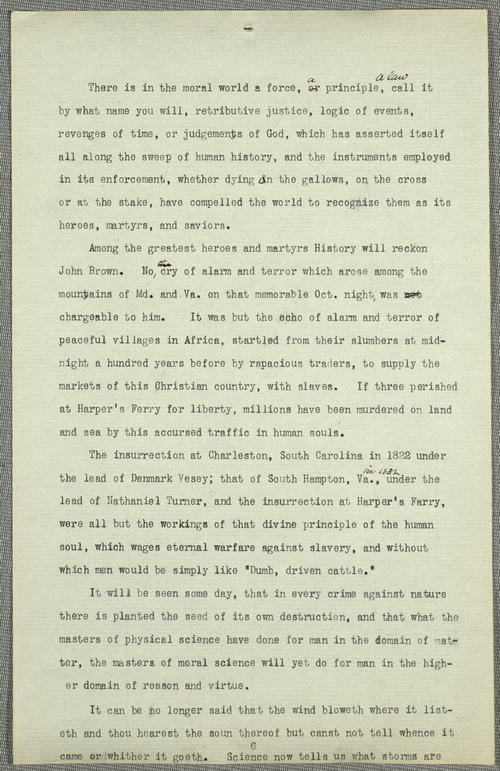 It was at once deeply impressed upon my mind, that, if Mr. Douglass could be persuaded to consecrate his time and talents to the promotion of the anti-slavery enterprise, a powerful impetus would be given to it, and a stunning blow at the same time inflicted on northern prejudice against a colored complexion. It is something to remember that we had him here when the fugitive slave bill was passed, and that the fullness of his indignation, his contempt of compromising legislation, the highest attainment of his eloquence, was listened to by those who packed the hall where he was to speak. Shall we ever forget one scene in Corinthian hall, - a breathless crowd, for Douglass was hurling out anathema against the bill. “Is there a man here who dares to say he has the right to sell his brother?” A voice clearly responded, “I do.” In an instant every eye saw the speaker - the finger of Douglass pointing him out as he stood, one of the outermost tier against the white background. “Turn your face to the wall then!” in withering tones, that must have made its owner wish he had kept silent. If it is deemed necessary that I should forfeit my life for the furtherance of the end of justice, and mingle my blood further with the blood of my children and with the blood of millions in this slave country whose rights are disregarded by wicked, cruel and unjust enactment - I submit; so let it be done! Although Douglass had no part in the raid, a warrant was issued for his arrest after Brown was caught. Federal marshals believed Frederick was an accomplice. When he learned what was afoot, Douglass fled the country. Five months later, after his daughter Annie (the youngest of five children) died, he returned to the States. While away, he had been cleared of any wrongdoing associated with the raid. The difference between seed-time and harvest may be much greater in the one case than in the other, but there is a certain harvest time for both, and though vast space intervene, and though neither they who plow nor they who sowed may live to reap, the harvest will come. Men are only instruments of this divine order, hence we must look deeper down than old John Brown for the cause and responsibility of this raid upon Harper’s Ferry. It was not a mere freak, a mere passionate outburst of human nature, the bloody fruit of that terrible hour was the growth of long years. It was planted with the first cargo of slaves, landed at Jamestown Va., and ripened by the heat and moisture of more than two hundreds years of cruel slavery. The cup of its iniquity was full. It is well said that no man can put a chain about the ankle of his fellow man without finding the other end about his own neck...If three perished at Harper’s Ferry for liberty, millions have been murdered on land and sea by this accursed traffic in human souls. It will be seen some day, that in every crime against nature there is planted the seed of its own destruction, and that what the masters of physical science have done for man in the domain of matter, the masters of moral science will yet do for man in the higher domain of reason and virtue. Before Frederick became an abolitionist, and after, anti-slavery activists published materials intended to expose the harms of slavery. A few selections from the Library of Congress will loudly speak for themselves. Bos, Carole "THE ABOLITIONISTS" AwesomeStories.com. Feb 01, 2005. Apr 20, 2019.